Subway Art is a great way to showcase your embroidery design and font collection. 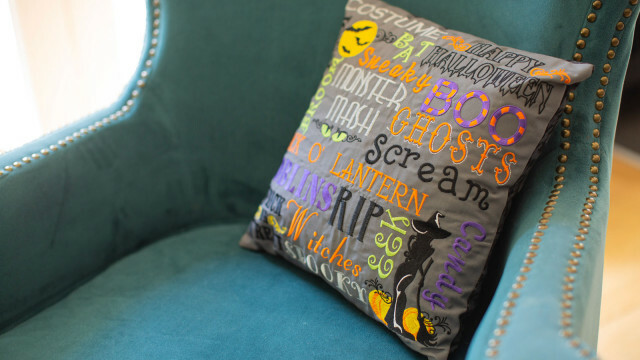 Combine your favorite spooky Halloween designs into a creative pillow! The multi­ needle jumbo hoop helps you create large embroidery stitch-outs that are perfect for making pillows and stretch canvas home decor! Download printable instructions. Using Designer's Gallery Embroidery Works, select Edit and Preference. Select Multi-Position hoop style and choose the 14x14 jumbo hoop. 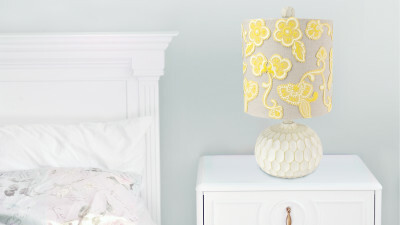 Create a list of words, names, dates or traditions that you want to include in your decoration. Select the "Create Letters" icon from the toolbar. Type out the word, select a font and place the design on the work page. Resize, edit and reposition the words for the desired look of your design. Add embroidery designs to your design by selecting the "Merge Stitch File" icon from the toolbar. Edit the colors of your design to consolidate the number of colors needed. Once your design is laid out as desired, press the "Color Sort" icon. Save the design to a USB drive to bring to the machine. The design will automatically be saved as a split for the jumbo hoop. 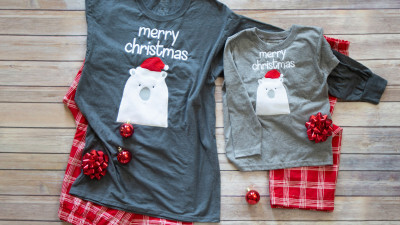 Prepare the fabric by cutting a 20x20 piece of fabric. Hoop the fabric in the jumbo hoop using tear-away stabilizer and spray adhesive. Change the Valiant or Enterprise frame holder to frame holder B. Attach the jumbo hoop to the machine. Select the design from the USB. It will be shown as a split design. Select the first half of the design. Assign thread colors to the needle and stitch. When the first half of the design is stitched, follow the machine instructions to place the positioning sticker and hoop. Select the second half of the design, assign colors and continue to stitch out the design. Once sewing is complete, remove from the frame. Gently tear away excess stabilizer. 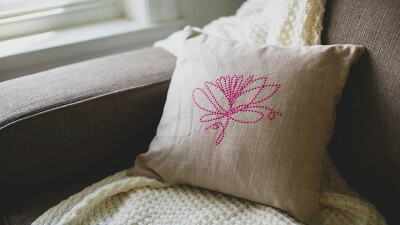 Trim down the embroidery for the desired pillow size. We trimmed to 15" x 15". Cut a backing piece to the same size. Stitch right sides together using a 1/4" seam allowance. Leave a 6-8" opening at the bottom. Trim the corners and turn inside out. Press. Insert a pillow form and hand-sew the opening to complete the pillow.